Al Baraka Banking Group B.S.C. is a Bahrain Joint Stock Company Licensed as an Islamic Wholesale Bank by Central Bank of Bahrain, listed on Bahrain Bourse and Nasdaq Dubai stock exchanges. It is a leading international Islamic bank providing its unique services to around one billion people. 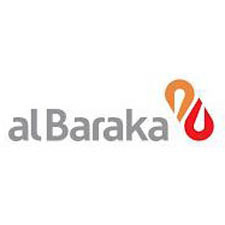 Al Baraka offers retail, corporate, treasury and investment banking services, strictly in accordance with the principles of the Islamic Shari’a Al Baraka is currently having a strong presence in Jordan, Tunisia, Sudan, Turkey, Bahrain, Egypt, Algeria, Pakistan, South Africa, Lebanon, Syria, Indonesia, Libya, Iraq and Saudi Arabia.